John Ireland was born in Ireland, his family came to the U.S. and eventually settled in Saint Paul. He was ordained to the priesthood by Bishop Grace in 1861, and then served as a chaplain of the Fifth Minnesota Regiment in the Civil War until 1863. In 1875, he was consecrated coadjutor bishop of Saint Paul by Bishop Grace and became the third bishop of the Diocese of Saint Paul (1884-1888) and its first Archbishop (1888-1918) when the diocese was raised to a metropolitan see in May of 1888. During his tenure, Archbishop Ireland became one of the most influential American bishops of his time. He was a dominant figure in religious, social and political spheres for over half a century, as his charismatic personality and commanding figure shaped both religious and civil movements of the late nineteenth and early twentieth centuries. Following Bishop Crétin’s legacy of encouraging Catholic immigration, Ireland brought Irish Catholic families from urban slums and helped them settle farmland in rural Minnesota, establishing new parishes and schools for them. Due to the expanding number of Catholics in the region, five new dioceses were created in 1889. Archbishop Ireland consecrated four new bishops for Fargo, Saint Cloud, Duluth, and Winona. The development of education is one the defining characteristics that Archbishop Ireland was known for. He founded the College (now University) of Saint Thomas in 1885, including the preparatory school now known as Saint Thomas Academy, the Saint Paul Seminary, and procured land for the College of Saint Catherine. 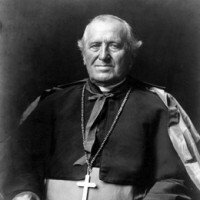 In addition, he was instrumental in the establishment of the Catholic University of America in Washington D.C., being one of four bishops who served on the founding committee. Archbishop Ireland’s vision for the Church was to be one that was robust, eminently visible, and characteristically American. A man of remarkable vision, he was a patriot whose loyalty to his country was second only to his love for God and the Church. Among the many parishes (26) and schools (39) he built and established for the Archdiocese, two towering examples of the vitality of Catholic Americans in the Twin Cities are the current Cathedral of Saint Paul on Summit hill, the highest point in Saint Paul, as well as Church (later basilica in 1926) of Saint Mary in Minneapolis. Archbishop Ireland became sick in 1917, and died September 25, 1918. After a very large funeral in the newly completed Cathedral of Saint Paul, he was buried in Calvary cemetery, Saint Paul, next to his predecessors, Bishops Crétin and Grace.